Approximate values for a specific soil can be obtained from the catalog of soils. 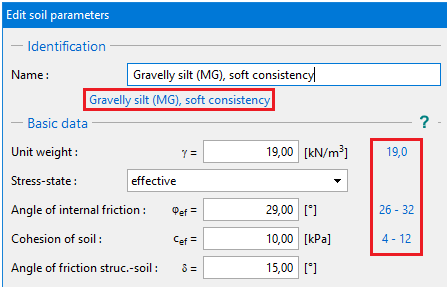 Select the desired soil in the combo list and specify its consistency or compactness, respectively. The soil parameters obtained from the catalog appears in the window. 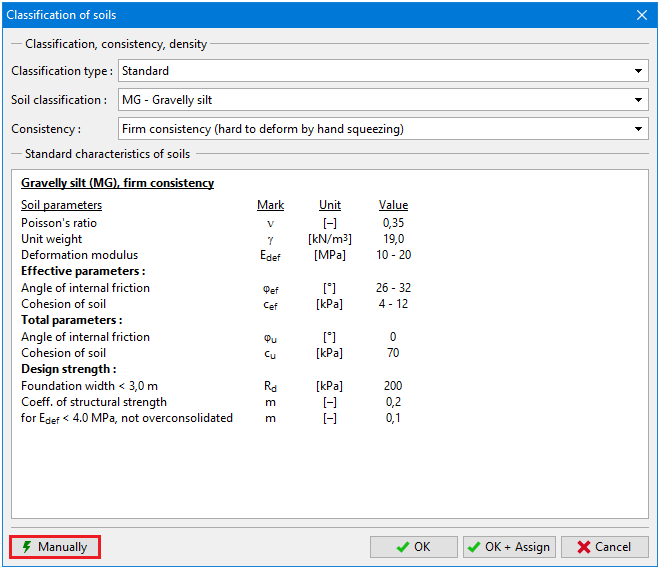 The "Manually" button opens the "Manual classification of soils" dialog window that allows to classify the soil if its parameters are known, e.g., from laboratory measurements (grading, moisture, compactness….). Pressing the "OK" button shows recommended values next to corresponding input fields (see picture) in the "Add new soils" dialog window. Pressing the "OK+Assign" button then assigns the average values of soil parameters into individual input fields. The "Cancel" button leaves the window with no action.